If you asked the players I coached while in England – and the coaches I worked with in that span – I think getting lots of touches on the ball would be something they’d point out as part of my coaching style. At least that was a major part of what I tried to do. Sitting in Jamie Morrisson’s session of the 2015 HP Coaches Clinic, though, I realized I should have been thinking a little more specifically about how I did that. Jamie brought up the term Read-Plan-Execute (RPE) to describe the full idea of what we’re after. By that he meant having the player reading the action leading up to the ball coming to them, making a decision on how to play the ball (finding a solution), then actually executing the required skill. This is something I’ve largely tried to do. I didn’t quite have the specific internal terminology developed yet, though. As a result, I was probably less efficient about it than I could have been. As coaches we can easily get caught up with the last part of that sequence, the execution. 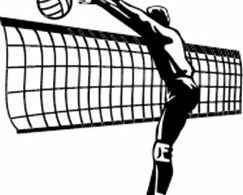 That’s the technical aspect of playing volleyball, after all. 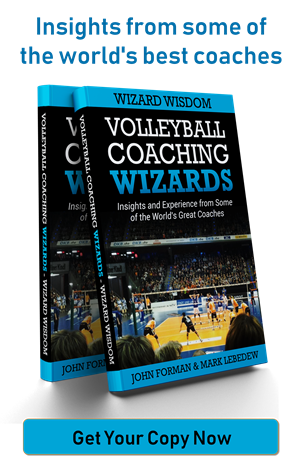 It’s my understanding that the technique focus really came into Western coaching in the 1960s. That’s when the Japanese teams were at the height of their international prominence. Coaches in many places sought to emulate their strong technical training focus. 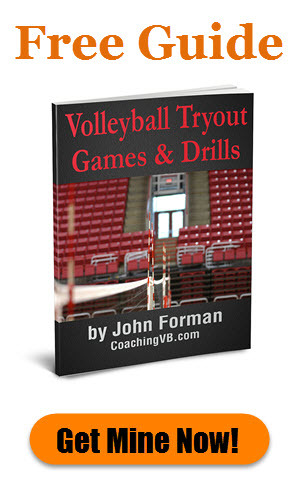 That hasn’t gone away in the decades since, though USA Volleyball (among others) these days takes a much more unified view of volleyball player development – broadly speaking, the game teaches the game. I’m not going to get into a full-on motor learning discussion in this particular post. It’s a big subject in its own right. There is one important point to make, however. In Jamie’s presentation he showed a pair of charts which demonstrate the performance difference of working in a block training (controlled, isolated reps) vs. a random (game-like) training manner. They both showed that while block training results in consistently better progression of technical skill execution, when it comes to retention, transfer, etc. random training is far superior. Notice how initially block training looks to produce better training result. 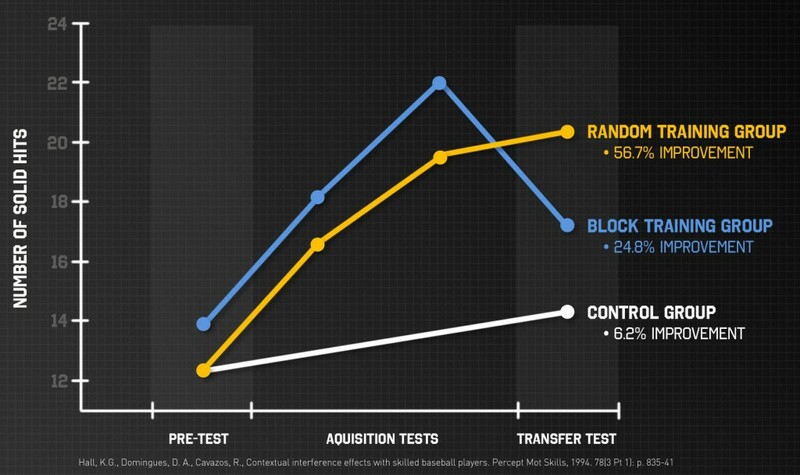 When tests were done on transfer to application (think moving from drills to a game) the block group showed a sharp drop in performance. Compare that to the random group. They not only retained their training gains, they also improved further. The point isn’t that we shouldn’t worry about technical execution. Instead, we should do it in an environment which forces the athlete to perform all aspects of the skill. That’s where the RPE idea comes in. What is a good rep, really? When working on hitting, coaches sometimes toss the ball for players to attack. They no doubt think of it as a way to give the players lots of “good” reps. 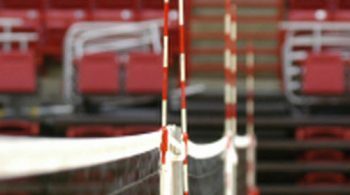 This may result in players who are good at hitting good sets with fixed timing. It stunts the players’ growth in terms of learning to handle different set tempos and placements, though. In other words, the coach has largely removed the read and plan aspects of RPE. The players are just executing. We can come up with similar examples with just about every other skill. Think about anything that involves a player executing a skill off a tossed or otherwise very predictable controlled ball. When we take the read or read-plan elements out, we actually hinder the long-term development of our players. All of this means we should be conscious of how we structure our games and drills to make sure we are getting full RPEs for whatever skill or tactic we want to focus on at the time. This generally necessitates have the contact or game situation prior included. 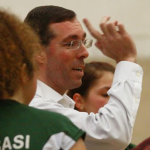 By that I mean something like when focused on setting, include a passer so the setter has to read the passer’s movement and position rather than simply going off a toss where little or no reading is involved. Or when working on free ball offense, having a free ball inducing situation on the other side of the net. Now, having said that, we don’t want to get carried away. In the setting example you could quite easily find yourself thinking “I should be maximizing RPEs for my passer as well.” That might motivate you to put something random in the chain before the pass, which might then have you thinking about something random before that, and so on to the point of basically just playing and starting everything with a serve. There is definitely value in having lots of game play in your practice, but training is about being focused on developing a certain aspect of your players’ or your team’s development. As such, you need to constrain things in ways that will necessitate the removal of the random element at some point. The key is identifying where that should be. The bottom line is that rather than thinking in terms of maximizing touches – as I’ve been doing – we should be thinking in terms of maximizing RPEs. For more on the difference between blocked and random training, and how that relates to making things game-like, give this post a read. 2 replies to "Going beyond maximizing player contacts"
Really enjoyed this article. Coaching U14s right now and I’ve known about the term RPE but have never been to a clinic that explains it. Thanks. Glad you liked it Julio. It’s definitely worth going to these kinds of events to get new ideas in how to contextualize what you’re trying to do.